This week from July 8-14, Toys R Us United States will be offering a free Ninjago Hidden Sword with purchases above $20 and a free Project Case with purchases above $60. Perhaps, the only stuff worth getting would be the two new LEGO Friends sets that are $11.99 each (Olivia’s Speedboat and Andrea’s Bunny House). 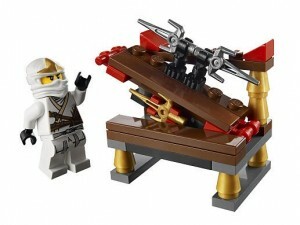 They’re overpriced by 20%, but you get a free Ninjago Hidden Sword polybag ($3.99 value). So in the end, you get to buy all 3 sets (including the polybag) for regular price without Toys R Us markups. This sure is a great sale!